Sure we’re supposed to always be kinder than we need to be, but how about a week specifically dedicated to projects which help inspire kindness throughout the whole community of Westborough?! 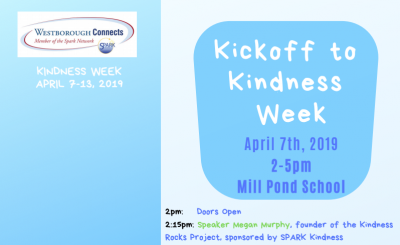 That’s exactly what Westborough Connects Kindness Week is all about! The kickoff to the week-long series of events begins at Mill Pond this Sunday April 7 from 2pm-5pm. All ages can join in for the featured speakers and kindness-themed activities. 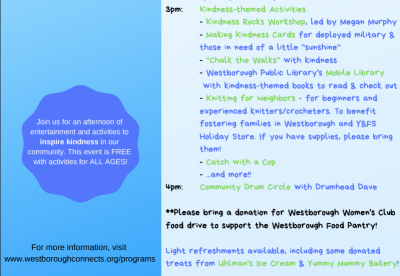 See the schedule for Sunday below or visit www.westboroughconnects.org for a complete listing of all of the week’s events.